Thought that would get your attention. Before I get started, I would like to say that I’m excited to say I am already over 700 page views for my blog since I started in July! I also want to say that I am kind of stoked that I have overseas visitors to my blog: Hello Germany, China, Netherlands, Ireland and Finland (Hi Eva!). I am so glad that you have clicked on my space here and that you have been entertained enough to come back. Thank you so much for the support! As the title implies, loving your bedroom is so important for many reasons. 1- it is where you spend most of your life; with your eyes closed at least. 2- it is the haven for your soul at the end of a long day. 3- it is the best room in the house: wink, wink, nudge, nudge. So why do so many bedrooms have treadmills in them with dirty laundry hanging over the top? This should be the one room in your home that welcomes you in after life has been a little rough and makes you feel peaceful, restored. The first thing any relationship expert is going to tell you is that you don’t need to be looking at pictures of your beautiful offspring when you are, well you know, offspringing. They can be anywhere in your home just not in your bedroom. This also applies to pictures of anyone other than you and your spouse. I mean really, do you want to look at pictures of your Aunt Flossy water skiing if you are trying to unwind after a marathon day? I love my children with everything I have and would do anything for them. I just don’t keep pictures of them on my bedroom walls. This is a great way to create relaxing light in your room and you could easily do flameless. Actually, I think that is safer in a bedroom for the sheer fact that you could fall asleep with a burning candle and that would not be good. One of my oldest daughter’s friends was walking down the hall toward our room early one morning after a sleepover and said: “Wow, your bedroom is so dark, it’s like a hotel room”. 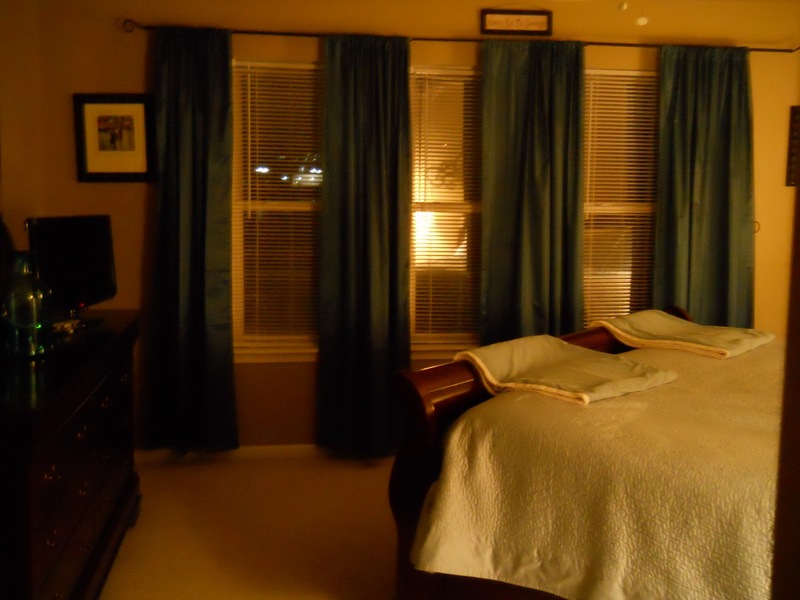 It is so nice and at night I feel so cozy and safe with my room darkening shades. One thing I do that some people may think is a little strange is that I take pictures of each room in the house in anticipation of us moving someday. I know it’s weird but I love to look back at how I decorated rooms, where I placed furniture, etc. and I think the girls will love to look back when they are older! I love this room since we recently painted it this great khaki color. The only thing with our room is this: we have had the bed in the same spot for five years. Now, I know for some people, this would be fine but I like to change things up. My 10-year-old LOVES to come home from school and find things in new places. So does my husband. My two-year-old couldn’t care less. Wait until she comes home from preschool to find her toy box somewhere new and then you will see how much she cares. So last weekend, my husband decided we are going to make a change. I know, it’s hard to tell the difference but we moved the bed to the right corner of the room so it is on an angle and we love it. The only problem is that we are having a hard time decorating the walls because the back of the bed faces the corner of the walls so any suggestions would be welcomed. Overall, we love the new arrangement, it makes it cozier and I have noticed that I am sleeping better because I am not right next to our cheap windows. I just love these and I love that the bed is facing the window. I feel like I am in some hotel suite in downtown Chicago. Without the noisy neighbors. And the bed bugs. I love your bedroom! Hubby can't believe it's your bedroom. Thanks to you we're redecorating! Good job my friend! Thanks for the post friend!